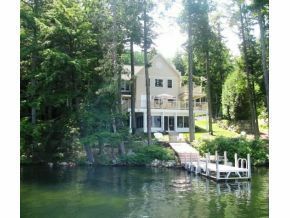 GREAT LAKEFRONT HOME ON 537 ACRE LOVELL LAKE, SPECTACULAR OPEN WATER VIEWS!!! 30FT BOAT DOCK, PATIO, NICELY LANDSCAPED WITH IRRIGATION SYSTEM AND A 3 SEASON PORCH THAT IS 14 FOOT BY 22 FEET !! FAMILY ROOM AT LAKE LEVEL. LIVING ROOM WITH GAS FIRELPLACE AND HARDWOOD FLOORS. BREAKFAST NOOK & DINING ROOM WITH HARDWOOD FLOORS. ALL 3 FULL BATHROOMS AND KITCHEN HAVE TILE FLOORS. MASTER WITH FULL BATH 6FOOT SOAKING TUB AND SHOWER, MASTER SUITE GAS FIREPLACE AND A PRIVATE WALKOUT SUN DECK!! LOVELL LAKE IS GREAT FOR WATER SKIING !! ONE HOUR FROM MANCHESTER/45 MINS FROM PORTSMOUTH. ADJACENT LOT FOR SALE. SELLER OFFERING AMERICAN HOME SHIELD WARRANTY. BROKER INTEREST. LISTED BY REMAX PROPERTY SPEC GROUP INC. For additional information on this home call Lady of the Lake Realty at 1-888-737-5550 or e-mail at info@nhlakesrealty.com or visit our website to view similar lake homes in New Hampshire at www.nhlakesrealty.com or www.lakeorskirealestate.com.